Learn how to make Palak Patta Chaat Recipe | Spinach Leaf Fritters | पालक पत्ते की चाट with step-by-step video tutorial. Palak Patta Chaat is an utterly stunning and delightful appetizer / Starter. Palak Patta (Spinach Leaf) Chaat is a North Indian dish prepared using besan/gram flour coated spinach leaves fritters, yogurt, green chutney, tamarind chutney, and sev (crispy fried gram flour noodles). 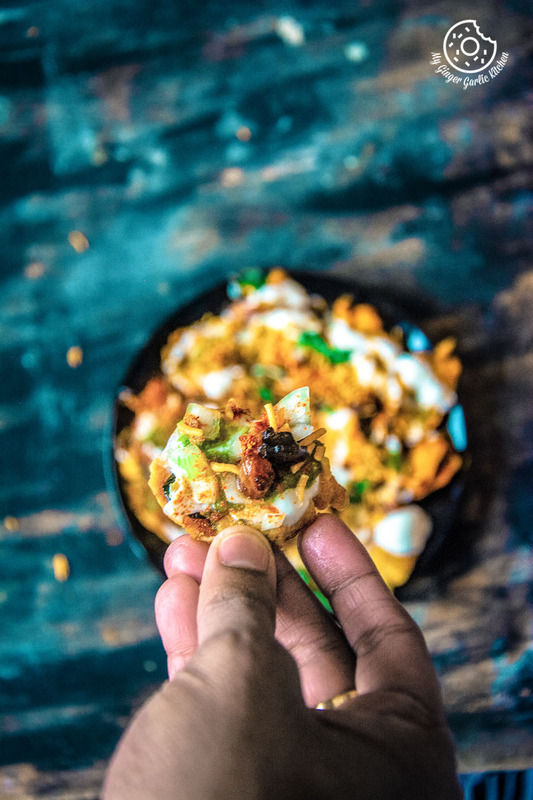 This luscious North Indian street food is definitely a crowd-pleaser, and also it makes a great brunch/snack for evening tea. 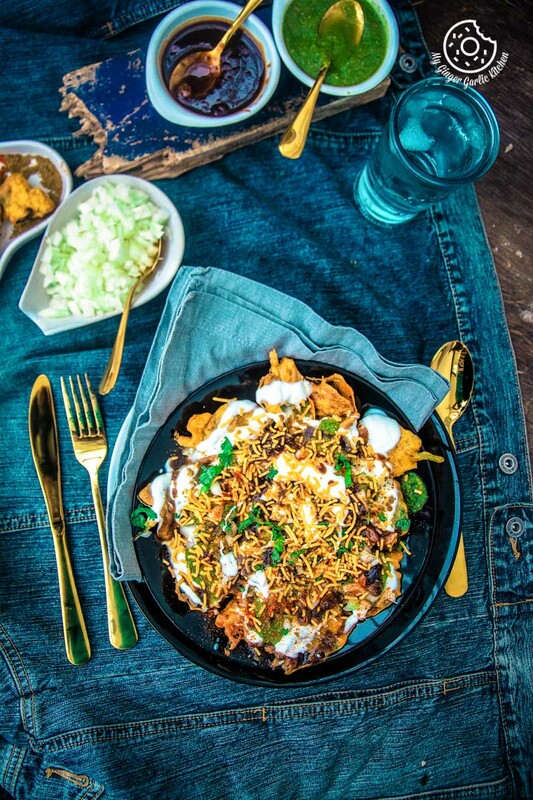 This chaat also makes a great appetizer for parties and get-togethers or evening tea parties. The nutrients, goodness and health benefits of lush green spinach leaves are conventional, there is nothing new I could tell you about this. We all are aware how momentous it is for us to have a balanced meal, and thus we try to include all things fresh and healthy in our daily diet. Jokes apart, but this is a surpassing dish, even for those who don’t eat palak/spinach or in other words people who hate the word ‘spinach’, especially the kids. I myself never liked any leafy greens as a child. But I wholly loved this leafy green whenever my Mom made green palak parathas using spinach, green palak puris using spinach or even palak pakoras which obviously had spinach in it. Now it’s a different story. It’s because I am a mother now myself. So naturally I always try to explore innovative ways to accommodate all leafy greens to my child’s diet. This is a tried and tested recipe with my little one — she totally loves spinach when it’s presented in the form of fritters. I was first introduced to this Delhi Style Palak Patta Chaat by my sister when I visited India a few years back. I absolutely fell in love with this light, simple, crispy, delicious, and quick chaat. She coated palak patta (spinach leaves) with besan batter, deep fried, and then drizzled with curd /yogurt, chutneys, and spices (dry masalas). 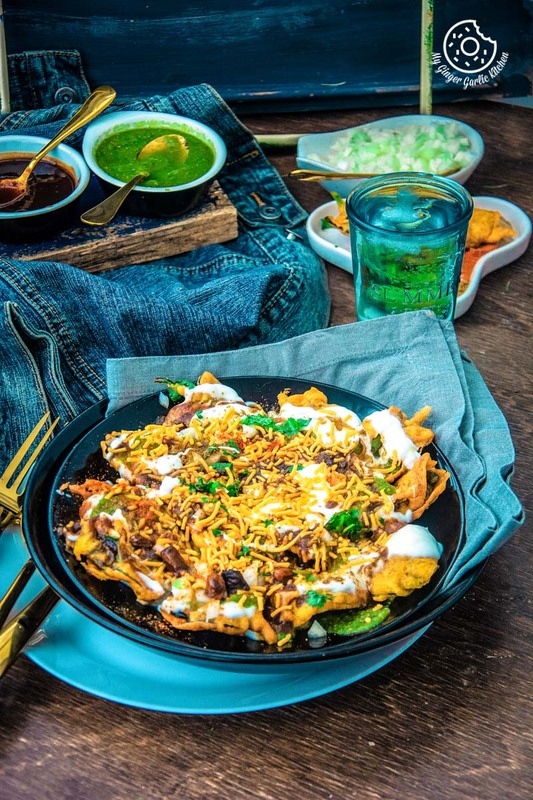 This ‘Palak Patta Chaat’ is quite similar to Dahi papdi chaat, but instead of papdi palak patta pakoras are used as a base, and rest is the same. 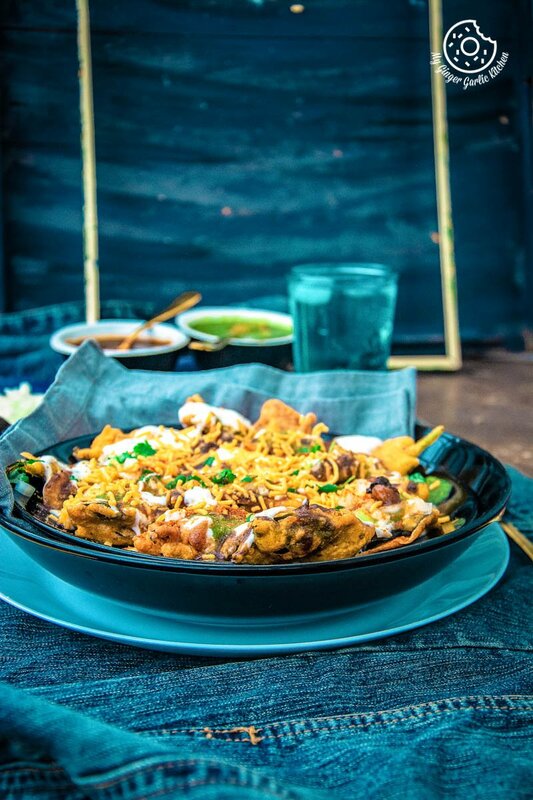 This recipe for palak patta chaat is an excellent amalgamation of supremely crispy, crunchy and soft textures, due to crispy and fried pakoras, crunchy onions, chilled yogurt, and semi-liquid chutneys. 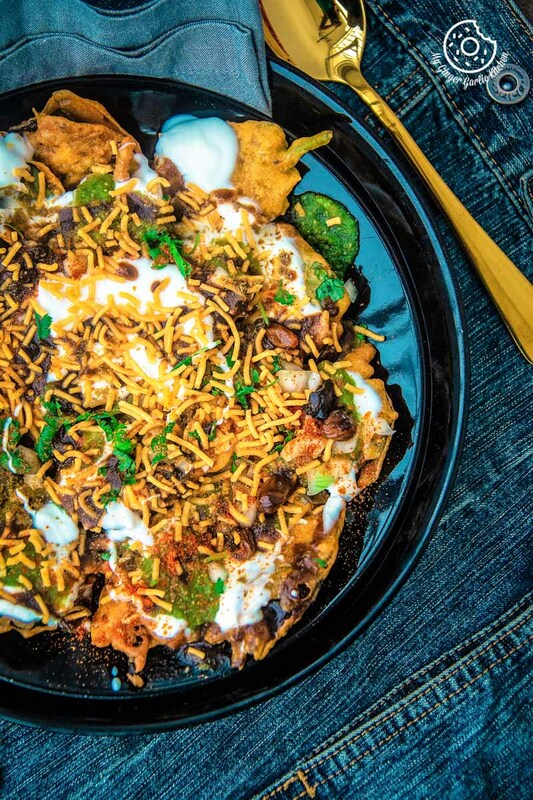 The flavor profile of this chaat is a combination of awesomely tangy, sweet & spicy, addictive substances. You can have it on any day but I try to relish it on cheat days because I just can’t stop it at just one or two. 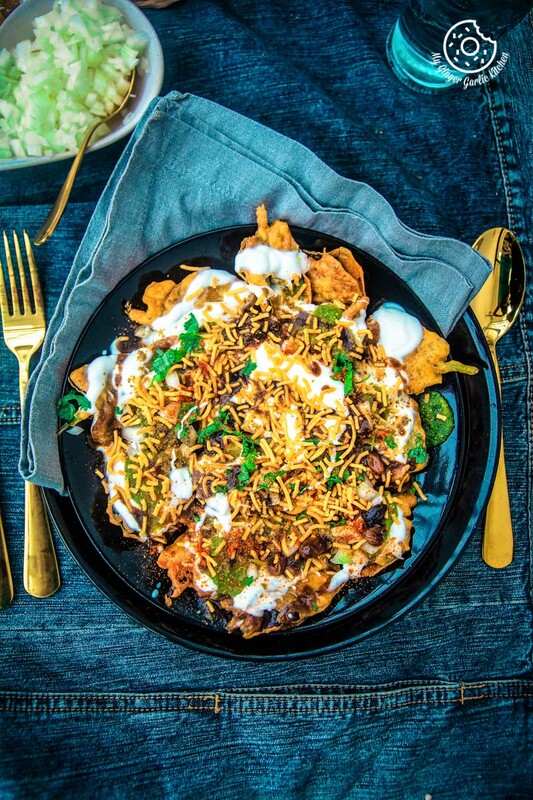 This palak patta chaat is a perfect illustration of Indian street food. Street foods in India are quite flexible and you can make any dish customized by adding or removing some of the ingredients. The street shop vendor organizes all things (chutneys, spices, veggies) in front. He throws everything into the dish right before serving it. Thus, the same dish can be comfortably modified for the people of different taste buds. Every individual palate can be pleased at the same time. You just tell him your preferred taste and he would make it accordingly within just a minute. 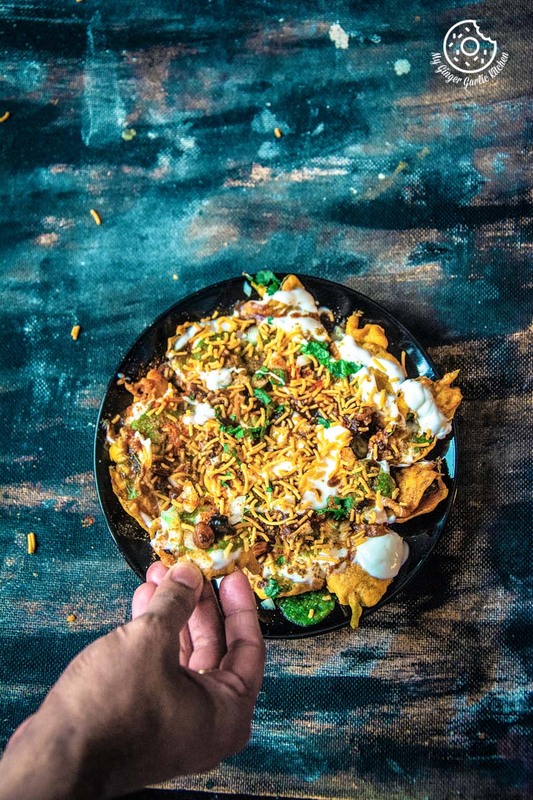 Usually, people want their chaats either with more chutney or less chutney, more spicy and mild, without yogurt or super clammy with extra yogurt (dahi), with onions or without. And the list goes on. These crispy fritter leaves are then drizzled with a generous quantity of whisked natural yogurt. Topped with sweet and tangy tamarind chutney (Imli Ki Chutney), spicy green chutney (Hare Dhaniye Ki Chuteny), sprinkled with chaat masala, red chili powder, roasted jeera powder. And finally dressed up with sev, chopped onions, and chopped coriander leaves. To make things faster and easier, you can totally make chutneys a day before. This way you’ll only have to fry the fritters and assemble them. If you are a vegan, then you can still enjoy this by simply swap the natural yogurt with vegan yogurt. Palak Patta Chaat is an utterly stunning and delightful appetizer / Starter. Palak Patta (Spinach Leaf) Chaat is a North Indian dish prepared using besan/gram flour coated spinach leaves fritters, yogurt, green chutney, tamarind chutney, and sev (crispy fried gram flour noodles). 1. Combine besan, rice flour, red chili powder, salt, carom seeds, ginger-garlic paste, lemon juice, and turmeric powder, in a bowl. 2. Add water and whisk well to make a smooth batter. 3. Heat oil in a deep frying pan. 4. Dip spinach leaf one at a time into the batter, and gently shake off the excess batter. 5. Deep-fry until crisp and golden. 6. Drain onto an absorbent paper, and set aside. 1. 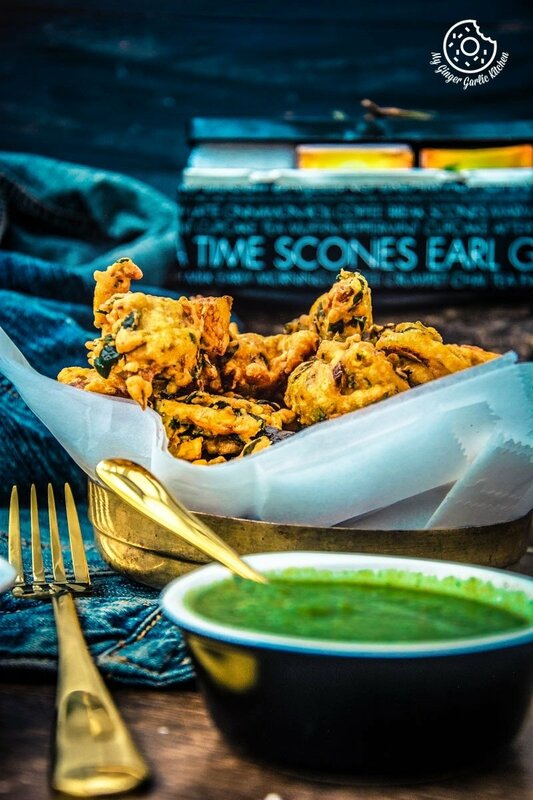 Arrange crispy, fried spinach leaf pakoras among serving plates. 2. Sprinkle with chopped onions, and drizzle with a generous amount of whisked yogurt. 3. Drizzle with green coriander chutney and tamarind chutney. 5. Top with a generous amount of sev. 6. Scatter with chopped coriander leaves. 7. Sprinkle with roasted cumin powder and red chili powder. 8. Finally Sprinkle with some more yogurt, more chutney, more sev and chaat masala.